In this lesson we divide fractions using the shortcut (multiply by the reciprocal of the divisor or 'flip and multiply'). The lesson also includes many word problems. The previous lesson introduces the reciprocal numbers and explores them conceptually. The video below explains the reciprocal numbers and the "rule" for dividing fractions conceptually. SHORTCUT: instead of dividing, multiply by the reciprocal of the divisor. This shortcut works always, whether the numbers involved are whole numbers or fractions. Notice: when you check the problems, you will need to use the original divisor, not the “flipped” one. 1. Solve. 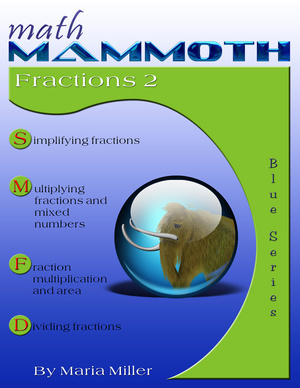 Change mixed numbers to fractions before dividing. Check each division by multiplication. 2. Write a division sentence for each problem, and solve it. In this, the divisor needs to be a whole number. 3. Solve these problems reasoning logically. Write a division sentence for each problem. share it equally. How much does each one get? 4. The picture shows how much pie is left. That is divided among a certain number of people. How much does each person get? Write a division sentence. 5. Three people share a 1/4-kg chocolate bar equally. How many kilograms will each of them get? of 11 feet of ribbon? How long is the piece that is left over? 7. Five siblings inherited a plot of land that measures 2 4/10 acres. If they divide the plot equally, what portion of an acre will each one get? a. 1/3 cup of wheat flour? b. 1 cup of wheat flour? long and 1/2 mile wide. What is its area? mile in area. How wide is it, in miles? In feet? solution steps as if the equation had whole numbers. In this case, we divide both sides by 4. 12. Solve these easy division problems! 13. How many 2/3 cup servings can you get out of 5 cups of ice cream? meters. If the length of the area is 5 meters, how wide is the area? 15. The sides of a rectangle are in a ratio of 2:3, and its perimeter is 1 1/4 inches. a. What are the lengths of its sides? 16. Mary’s vegetable garden is 6 1/2 feet by 6 1/2 feet. a. Find its area in square feet. b. Find its area in square inches. vegetables. What is the area of one of those quarters in square feet?